My treasure of a dentist, the most caring of all dentists I ever had, said the darnest thing to me the other day: “You do research, really? Good for you. I could never do it myself, it’s so boring.” She said it as she was reaching for a sharp triangular implement which, she explained earlier, was “like a cookie-cutter, but for the gums.” Cookie-cutting gums is fun for her, you see. Research is boring. My jaw would have dropped if my mouth was not already propped wide open with a different triangular (this one rubbery, not sharp) implement. Research, boring? I mean, seriously!? But in a way I see where she is coming from. Academic research in general, and academic publishing in particular, are so specialized and regimented that they may come across as stuffy, and, yes, at times even boring. There is only that much opportunity for fun and humor in publishing serious work. In his book Audition, Michael Shurtleff, a famous casting director, points out that there are opportunities for humor in dark and emotional classic dramas — an observation that startled me because humor is among the last things I would associate with serious dramatic work. Surely, if there are ways of injecting humor into the disturbed darkness of Who’s Afraid of Virginia Woolf?, there are ways of injecting fun into academic publications? A reference to a Runners World article by Jeff Galloway, an Olympian and a famous running coach, among references to classic papers, by the esteemed giants of the networking community, that appeared in journals with titles dramatically dissimilar to “Runners World” (IEEE Transactions on Information Theory, IEEE/ACM Transactions on Networking, IEEE Journal on Selected Areas in Communications). A 100-times-per-second snapshot of my three (3) hour marathon preparation run. 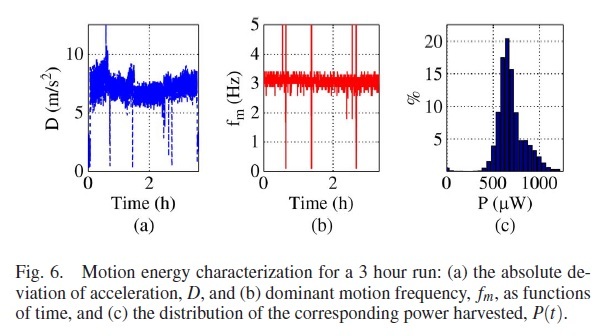 In this paper, Figure 6, “Motion energy characterization for a 3 hour run“, is me preparing for my second Philadelphia marathon, a second of the three “long runs” of a marathon preparation program loosely based on Hal Higdon’s marathon training plan. I now wonder — where does this “cameo appearance” stand? What do others sneak into their papers? Scientists can have fun — including dancing their PhDs. How many scientists have fun with their writing, in ways that a casual reader may not immediately spot?